The U.N. is alarmed that not only have 372 journalists been killed since 2006 and many thousands of others persecuted while covering their local beats, but that the perpetrators almost always escape prosecution. The murders of nine out of ten journalists are never solved, said the International Freedom of Expression Exchange. Another finding is that while the murders of journalists captures headlines, the great bulk of press intimidation and interference with coverage takes place at the local level. The press release we received from the U.N. about the new initiative and World Press Freedom Day May 3 warmed our heart because we are under threat of being “beaten to a pulp” by an Assembly delegate of the PR Society. It used guards to block us from all the events at the 2011 conference in Orlando including the Assembly, exhibit hall and opening night reception. There can be no doubt about the Society’s threats to physically assault us and its written boycott of the O’Dwyer Co. even though VP-PR Arthur Yann denied on PR Newser March 6 that any such boycott exists. 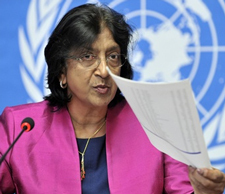 UNESCO officials, led by Navi Pillay, High Commissioner for Human Rights, say the blatant persecution of journalists with “impunity” by the perpetrators discourages other reporters from investigating corruption. Governments and non-government organizations often sit on their hands or ignore the press-bashing, say the officials. UNESCO asked 27 countries for evidence of judicial follow-up on murders of reporters in their countries in 2008-09 and only nine responded. 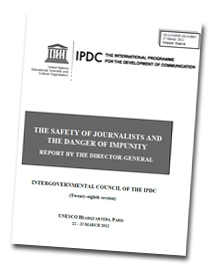 UNESCO has issued a 51-page report on its quest (PDF) to end impunity for those attacking or impeding journalists which includes an educational campaign aimed at governments and trade associations. Goals are not only to punish press-bashers but to stop such activities before they start. Local governments and trade groups turning a blind eye and deaf ear to press persecution is no surprise to us. Politics (who is in bed with whom) is the culprit. We have sent documentation of PRS’s blockage of coverage plus its campaign of slander and defamation conducted by PRS on PR blogs to nearly a dozen press and PR organizations but only two have condemned the PRS boycott, National Press Club and PR Watch. --Society of Professional Journalists, where we have been a member 50 years. --New York Financial Writers’ Assn., member 50 years. --Overseas Press Club of America, former member 25 years. --Committee to Protect Journalists ($13 million treasury). --Committee of Concerned Journalists (both the Pew Research Project and CCJ are headed by Tom Rosensteil, former media critic, Los Angeles Times). Futile efforts to get responses from any of the above groups were reported Nov. 14, 2011.